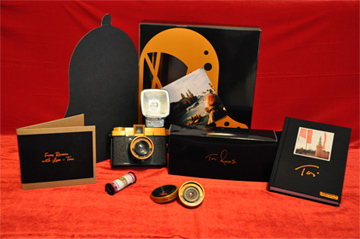 The "TORI" Limited Edition Diana F+, Custom "China" Lens set & Exclusive - Unreleased Live Moscow Double CD. We are excited to be releasing this very limited edition Lomographic 35 mm camera set called "TORI". Only 2000 of these Signature Edition cameras are in production and each includes a custom "China" edition Wide Angle and Close up Lens set, appropriately named "Distance" and "Close". Each box also includes an exclusive unreleased Double CD called "From Russia With Love..." which is the live show from her Moscow concert recorded September 3rd 2010. All CD's in this limited release will come autographed by Tori. Set also includes unique die cut Piano box, One of 6 unique photos taken with Tori in Moscow using her TORI Camera, Roll of 35mm Film and special glossy black flash.